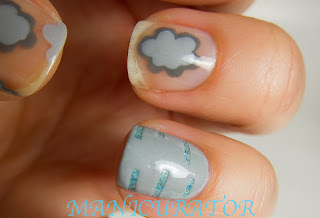 Moving right along with our Spring challenge, here's April showers for you!! 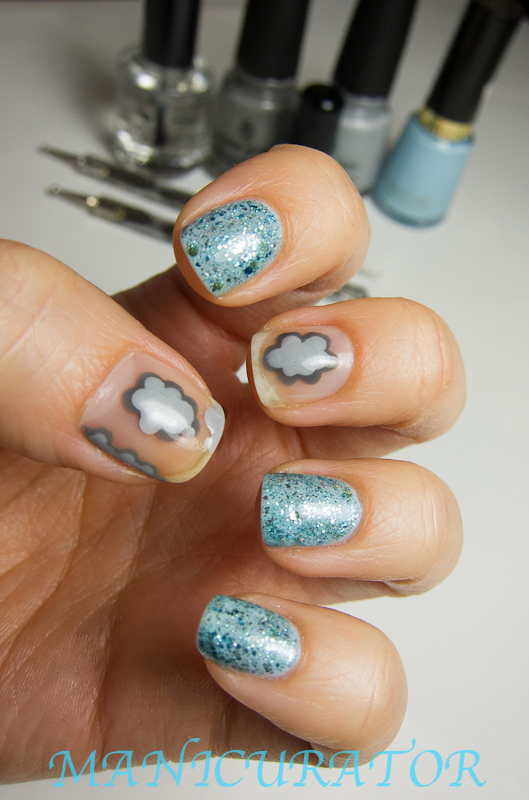 My idea was to make rain clouds and of course, have the rain drops falling from them. 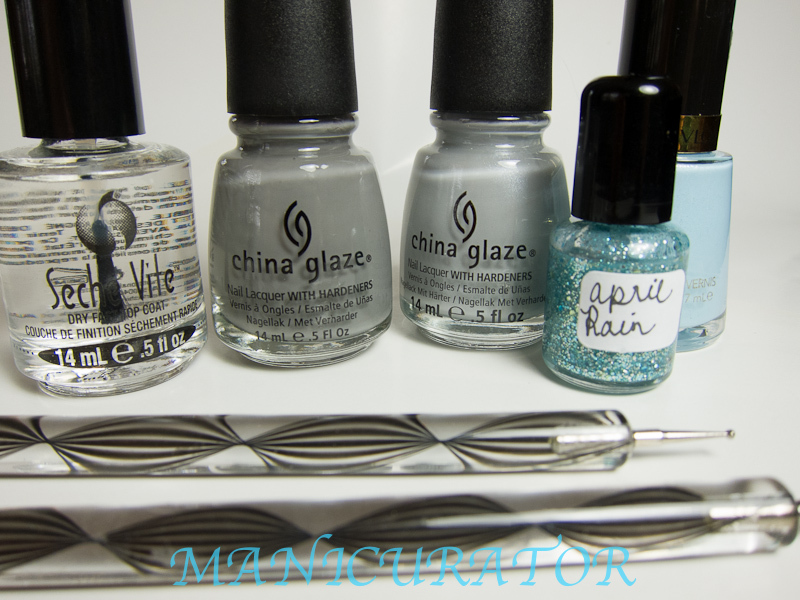 I definitely like how this turned out, but my favorite part about it is that the rain drops are a polish from one of my favorite indie brands GlitterDaze, called APRIL RAIN :) This is from her Simply Spring collection which I will review in a future post. You can purchase April Rain and all of Sana's other beautiful creations at her etsy shop, right here. 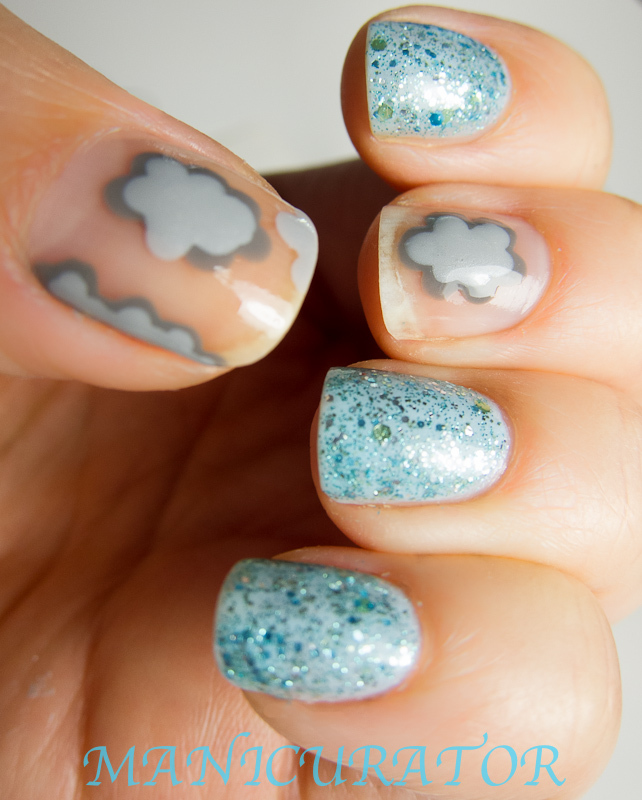 I used a base coat of gelous, and then dotted on my dark grey clouds with China Glaze Recycle. 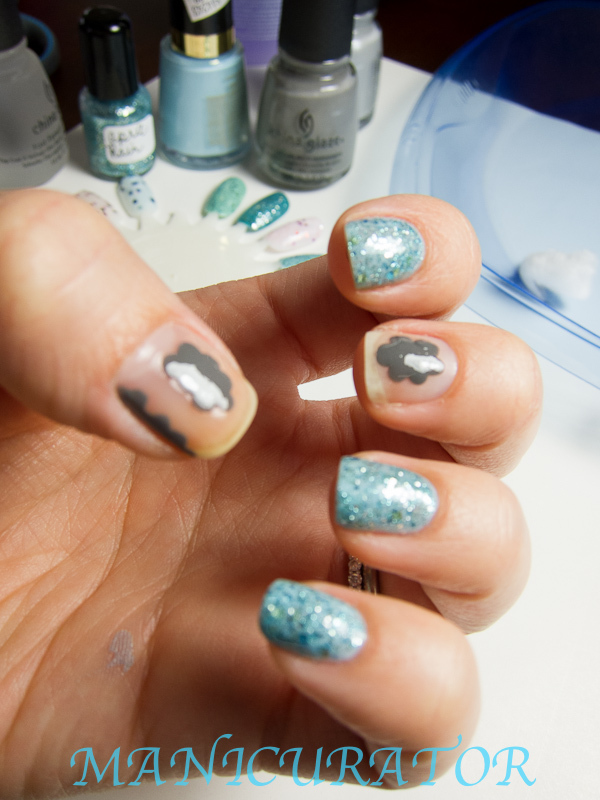 I then painted a coat of Revlon Blue Lagoon for the non cloud nails. Once dry, I dotted on the light grey clouds with China Glaze Pelican Gray and did one coat of GlitterDaze April Rain on other nails. Then a coat of Seche to speed along the whole process and give a smoothness to the glitter. I almost left the manicure like this, because, uh, I LOVE this glitter. But, I continued on, with my "plan". 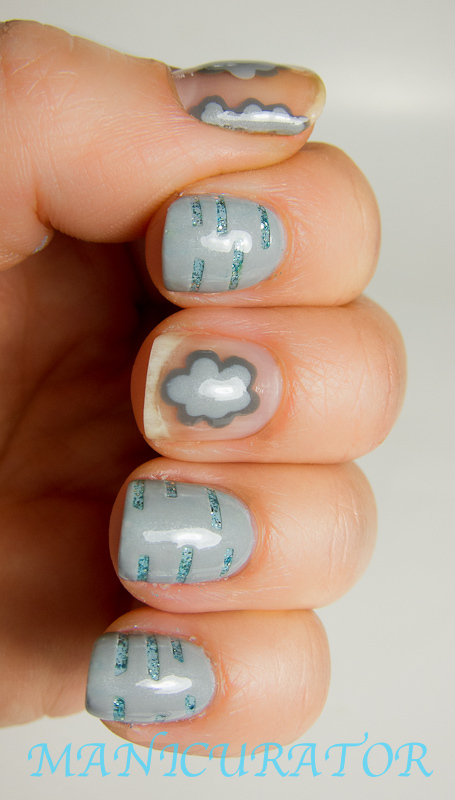 Using striping tape on the now dry nail, I created my raindrops. Two thin coats of Pelican Gray, carefully lift the striping tape, one at a time (before the polish dries!) and there you have it! What do you think? 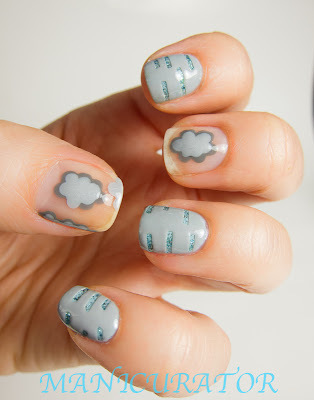 Does it look enough like a rainy day? I love that glitter! Very cute! Wow. Came out awesome. Love your take on it. The raindrops look cool peeking through. Nice idea! That glitter is really beautiful. I like how it peeks through. But I almost have to say that it's a shame that it is all covered. I am just LOVING this idea!! I am most definitely going to have to try this one out! Soooo many cool ideas sparking! Nice work! Btw... I have nominated you for an award ♥ You can find my blog on my profile! Keep rockin it lady!